You know when you suddenly have a craving so bad that you just can't stop thinking about it for days? That's what happened to me recently when I started craving for anything cheezy and all I can think of were those delicious baked rice dishes at Tori Chizu. I can't believe it took me this long to actually write about it. I swear, the 1st year of motherhood just went by like a blur that I hardly had time to do anything but to take good care of my babies. No regrets though and here I am making up for lost time by telling you about my food discoveries. So anyway, back in July (I know! ), Paul and I chanced upon Tori Chizu at Eastwood City Walk. We used to frequent this part of town a long time ago and it was only when we agreed to meet up with some friends that we found ourselves in this familiar part of town turned not-so-familiar as there sure were a lot of changes from our last visit which was half a decade ago. Tori Chizu is from the same company handling Bonchon Chicken so you're assured of getting affordable delicious meals all the time. My family is such a fan of Bonchon as we love that they have been very consistent in terms of taste and quality. 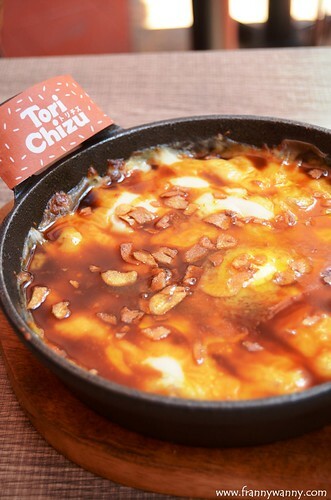 That said, I was really excited to give Tori Chizu a try more so in knowing that they specializes in cheezy rice dishes. We managed to try a number of Doria which means Japanese Baked Rice on our first visit. Let me start with the TC Original Chicken Teriyaki (Php. 145). You'll surely exclaim "wow!" with the overload of cheese enveloping the tender teriyaki chicken bits and a generous amount of rice underneath. The serving was very generous in my opinion that two can actually share one order and still have space to get a side dish or dessert. I love how the chicken was so flavorful and not dry at all. It was such a delight to enjoy both sweet and savory flavors per spoonful. Next was my personal favorite -- the Sesame Fish (Php. 155). One fillet of John Dory fish on top of a pan of fragrant Japanese Rice and covered with delicious sesame cream. It's simple yet very addicting. I wasn't expecting that this will be my favorite but I somehow ended up finishing more than half of the pan as it was just so good. In fact, I went back two weeks after and had this once again. Luckily, Paul liked this too so he didn't mind sharing it again with me. The Kani Takoyaki (Php. 155) was also very interesting. If you like kani sticks, nori and cheese then this one is for you. I like how they have incorporated some bbq sauce into the sauce and it worked out pretty well making this another winning dish. My only concern is how the kani sticks ended up sticking all on the cheese thus after you've consumed them all, you're left with.. plain baked rice. Unlike the other two which had more sauce thus giving more flavor to the rice as well. If you like beef then you should go to the Beef Yakiniku (Php. 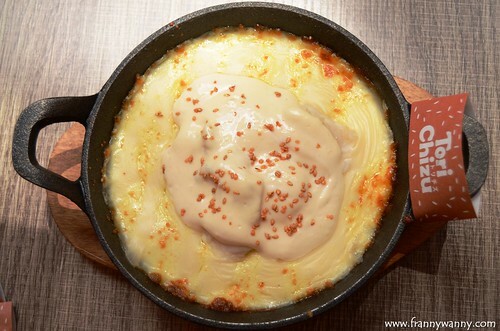 175) which is already the most expensive Doria on the menu but if you think about it, you're getting a generous amount of beef strips on a bed of rice with loads of cheese, garlic and a small piece of butter making it even more umami. 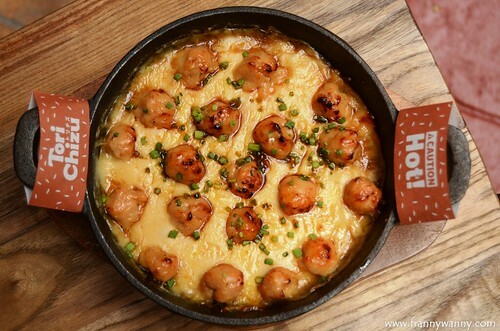 This is probably the best choice for a quick date night at Tori Chizu. If rice is not your thing (actually even if it is...), take my advice and order the Mazemen (Php. 115). This is the Japanese take on the classic Carbonara and boy, oh boy was it soooo good! I loved this together with the Sesame Fish Doria. You get dry ramen noodles topped with bacon, corn (I asked to removed this on my bowl), spring onions and Japanese egg. 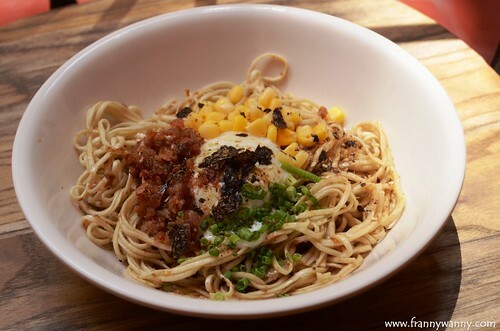 As soon as it gets served in front of you, quickly break the egg and give the noodles a good toss. Oh, thinking about it is making me drool! :p~ I was so surprised that ramen noodles actually works with creamy sauce. Of course we can't let the opportunity pass without trying their Umami Style Fried Chicken (Php. 195 / Php. 375 / Php. 495). 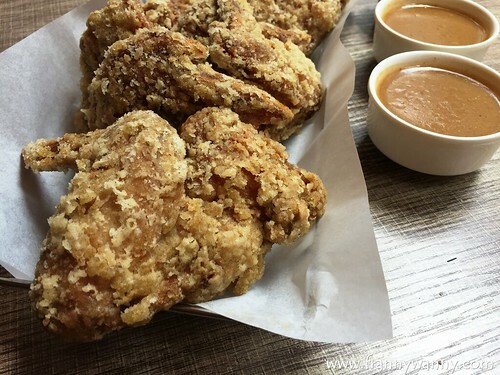 This is, after all, the same company behind Bonchon Fried Chicken so we expect to have meaty, really juicy fried chicken and yes, we were not disappointed at all. It was so good that I barely touched the gravy that came with it. How I wish they can do a meal where I get a piece of fried chicken and one order of Mazemen. Yummy! Lastly, we tried the Hambagu Sandwich (Php. 105). If you want it light then you can try this. 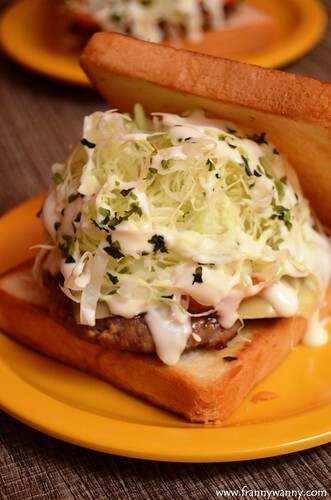 Japanese-style burger sandwiched in between two toasted bread and topped with shredded cabbage, tomatoes and cheese. For dessert, I tried the Milkchiz Soft Serve (Php. 45) on a cone. It's cheese soft serve ice cream which is so yummy! It has a nice sweet, salty combination and the texture was so smooth which I really enjoyed. I got to admit though that the cheesy flavored ice cream was a bit too heavy so be sure to save space for it or have it in a cup (Php. 35) and share it with a friend. 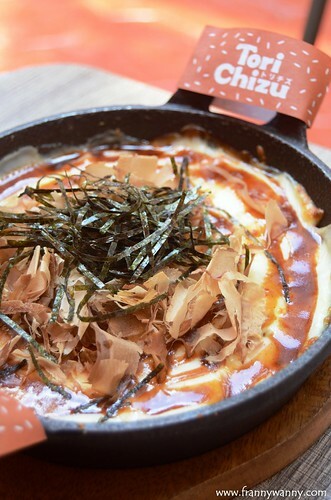 At present Tori Chizu has 6 branches nationwide and it's definitely a good place to dine in with your barkada, family or when you're just in the mood for good Japanese baked rice meals. 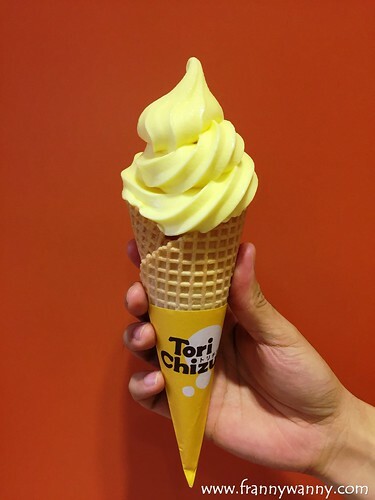 Visit Tori Chizu at Eastwood Citywalk 2, Eastwood City in Libis, Quezon City. They also have branches in SM Megamall, Katipunan, UP Town Center, Keyland in Makati and in Trinoma. 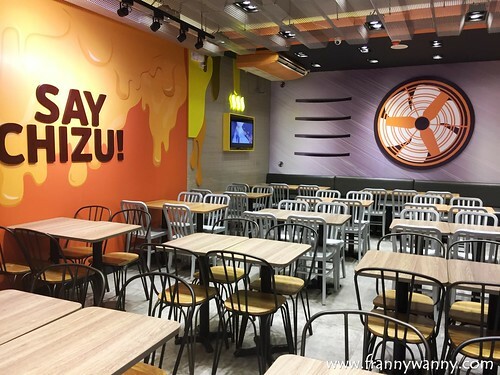 I hope they'll soon open in Greenhills and branch out outside Metro Manila too.